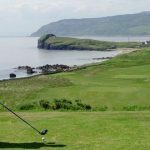 A fine spring day with a brisk breeze greeted Dunaverty’s members in their April medal and some excellent scores were recorded. None more so than Campbell MacBrayne. Despite a lengthy absence from the links, Campbell showed that he had lost none of his skill over the eighteen holes of the Dunaverty course. 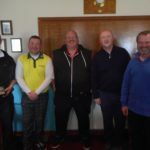 He shot a front nine total of 34 and with a 35 on the inward nine to record a nett 60 to deny an inform Alistair McConnachie, Ken MacMillan and Neil Brodie, all on 62, the top spot. Alistair also had a scratch 69, but having voluntarily cut his handicap from nine to seven just failed to match Campbell. 5 Robert Coffield 77-10=67(bih), 6 Donald Brown (SE) 86-19=67.